Video wall software that lets you display content from any source, anywhere on display walls of 100+ screens using just 1 PC/Server or directly from the cloud with no onsite server at all. Control the video wall and interact with it from a desktop or phone, locally or remotely. 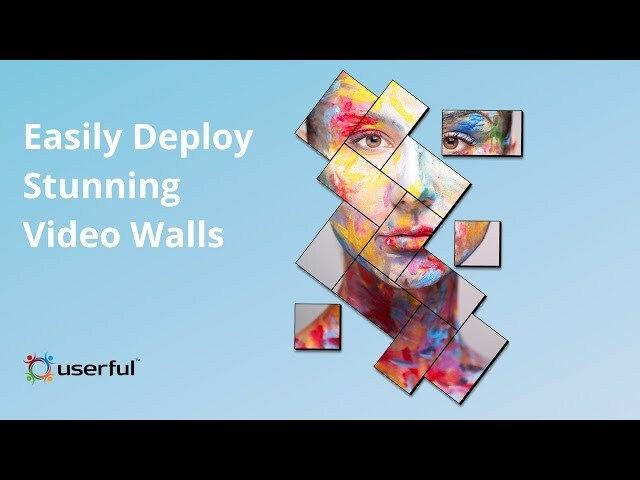 Userful is the easy way to deploy not just video walls but displays of every kind. A scalable, flexible and secure visual networking platform, Userful makes it easy and affordable to centrally manage all the displays that power operational productivity. business communication, collaboration and customer engagement organization wide. Userful’s easy-to-use, browser-managed video wall software delivers high-end features with unparalleled performance and flexibility. Userful’s On Premise solution uses off-the-shelf, standard hardware while Userful Cloud requires no additional onsite hardware and connects to displays directly from the cloud. Either way Userful makes deployment and management simple, and ensures customers don't overpay for proprietary hardware. Userful is compatible with LCD, LED, and projection-based display systems and can simultaneously control systems with different display types, resolutions, and aspect ratios. Userful delivers maximum content flexibility: virtually any source anywhere on the video wall. For more about how Userful on Premise or Userful Cloud work, visit our How it Works page. This video shows how easy it is for anyone to make/deploy a video wall, from the hardware needed--standard PC, long-lasting zero clients with no movable parts in each display, and existing Ethernet infrastructure and how to connect it to all the advanced features. Click here to schedule a call with a video wall expert at time convenient to you. What I like about Userful is that not only did it fulfil all our requirements but it did so at a great price. A lot of other video walls we considered looked like they were designed 15-20 years ago and didn’t look like they had much of a future technology wise. And they also were super expensive compared with Userful. In a 2018 survey 84% of Userful customers say it's "easy to manage" or "very easy to manage" when compared to other video wall solutions they have used. In a 2018 survey, 58% of Userful customers say Userful was 1/2 the cost or less than other video walls they considered for their project.